What if it were always winter and never Christmas? How would you describe winter? I always struggle with the lack of light, long nights and short days. It is dark, gray and cold. We spend more time trying to get warm and stay warm. We have all been warned about hypothermia and its effects. If you get cold and stay cold for very long you lose consciousness and then you die! So in the winter we insulate and isolate ourselves from others. Not only do we wear more clothes, we stay in more often. We spend more time alone. We eat more and exercise less. We are preoccupied with our own needs. When we look around there are few signs of life. Nothing seems to grow or bear fruit. There are even more deaths during the winter months. Some people talk about reaching the “winter” of their personal life while others wonder about the state of our nation or the world. Have we reached the “winter” of creation? Imagine a world blanketed by isolation, negativism, despair, selfishness and hopelessness. What if it were always winter? In a recent rereading of C.S. Lewis’ The Lion, the Witch and the Wardrobe (as well as driving in the northern part of our nation through snow squalls), the images of the snow-blanketed land of “Narnia” came to mind — a land ruled by a wicked witch whose magic spell keeps the entire land always winter, but never Christmas. We live in a world under the spell of evil, a world committed to making it winter but never Christmas. Take away the Nativity scenes. Remove any religious symbols. Change the words in Christmas hymns to make them completely secular. Cut off the Salvation Army kettles because they are doing good in the name of Christ. Remove the name of Christ so it is just a vacation day. Then remove holiday, because it has its roots in a holy day, and we are left with “Season’s Greetings” or “Happy Winter!” Perhaps the work of the White Witch is more real than we care to admit! Think for a moment about a Christ-less world. Is that really what we long for — just winter and never Christmas? Imagine a world without the selfless love that Jesus taught, a world without the support of widows and orphans, the sick and disabled, or comfort for the dying. These all started with Christians who built, staffed and paid for hospitals, orphanages and nursing homes. It was those following Christ who founded the Red Cross, the Salvation Army, Lutheran World Relief, Compassion International, Habitat for Humanity, and a host of additional caring agencies. In a Christ-less world education would be set back countless years. There would be no Oxford, Cambridge, Harvard or Yale. In fact, the first 200 colleges and universities in the United States were founded by those following Christ. So much good would be missing in a Christ-less world. We would be without hope, living in isolation and despair. Without that first Christmas, I wouldn’t be writing this and you wouldn’t be reading it. Into such a world as this, Jesus was born — a world of decadence and decay, immorality and injustice, deceit and corruption, poverty, distrust in government, doubt and misunderstanding, spiritual immaturity, and the worship of countless pagan deities. It was a world of broken relationships, dishonor and divorce, aliens alone in a foreign land, and the slaughter of innocents. Before Jesus came into the world it was always winter and never Christmas! Jesus is not put off by the winter of our worldview, the spell of the White Witch, or the presence of evil and its influence. He enters into the midst of our world for the very purpose of confronting and doing battle with such forces. There is power in the name of Jesus. Paul writes that one day “at the name of Jesus every knee will bow and every tongue will confess that Jesus Christ is Lord to the glory of God the Father.” The power of Jesus goes to work every time the Gospel is proclaimed. It is nothing less than the work of the Holy Spirit calling people to faith in Him. There is our hope! Jesus breaks into the world and into our lives to bring us hope! Mary felt something jump inside of her when the angel first spoke to her. Luther says the greatest power at work in the Christmas story is not that God became a baby. With God all things are possible. The greatest power at work in this Gospel is that Mary believed! Mary trusted the Word concerning Jesus and she was filled with hope! Joseph’s heart was changed, his own will subverted when he heard the news of Jesus through the message of an angel. He believed and his hope was renewed! In Lewis’ masterpiece, the children journey to meet Aslan at a famous landmark called the Great Stone Table, all but Edmund. Edmund sneaks off with his friend the witch. Only this time the witch doesn’t treat him as well as she did previously. Isn’t that what sin always does to us? It appears to be fun and rewarding but it ends up enslaving us, ruling over us like a tyrant. The White Witch is furious with him for failing to bring his brother and sisters to her, and even more furious to learn that Aslan has entered Narnia. The story reaches its climax with Aslan, the children, the witch and Edmund meeting at the Stone Table. Now Edmund is her prisoner, a traitor. The witch reminds Aslan that according to ancient law, all traitors belong to her and she has the right to kill them. Aslan promises, “all that can be done will be done” for Edmund. So Aslan offers her a trade — his life for Edmund’s. In the most dramatic scene, the witch has Aslan the lion tied down, shaved, humiliated and put to death on the Stone Table. The table breaks in two much like the curtain of the temple was torn in two! The children are in despair. All hope is gone. How could this happen? How could one so powerful have something this awful happen to him? Just before dawn, the girls sneak back to the now-deserted Stone Table and untie the ropes around Aslan’s dead body. His body is mangled and mutilated, but a few minutes later, they can’t believe it, as life actually returns to him, and they witness his resurrection. Aslan explains that, while ancient law dictates that all traitors belong to the witch, an even more ancient truth is that when a willing victim who has committed no treachery is killed in place of the traitor, death will work backwards and restore life to the innocent victim. The battle against all the forces of the witch begins with Aslan and all his followers who are restored to life, turned from the stone they had become into living beings again. The White Witch is defeated, a celebration ensues, it is Spring again, the ice melts and the snow is replaced by the warmth of the sun. All of Narnia lives in peace and joy — especially Edmund, the wayward boy whose life was redeemed by the innocent lion. 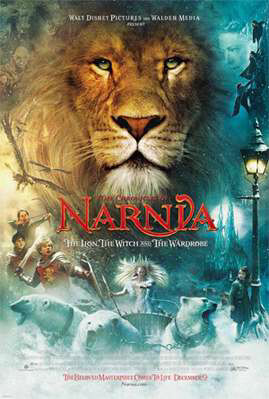 The story of Narnia is a compelling one because it is rooted in history. It is a story that really happened. It is the Christmas story that takes us all the way to Easter. The real power of Christmas is not that Jesus became a child but that Jesus came to offer his life for ours. He came to save us, redeem us and give us new life. He came to bring hope, joy and peace. These are all ours through faith in Him. When Lewis decided to follow Jesus, it was like the snow melted from his heart. He came to Christmas, because Christmas came to him. Lewis began reading the Bible, attending Church, praying consistently, helping the poor. For the rest of his life he donated two-thirds of all his book royalties to widows whose husbands had died in World War II. The Lion, the Witch and the Wardrobe came out of Lewis’s personal experience. He was Edmund, a traitor who experienced what it was like to have someone die in his place. It is not just his story, but it is mine and yours as well. Even more, it is the story of the God who so loved the world that He came on that first Christmas and comes this Christmas as well — not to judge us or condemn us but to save and redeem us. He came to melt away the ice of depression and despair with his love. He came to replace the oppressive gray sky and cold with grace and truth. He came to exchange the isolation and insulation in our relationships with forgiveness and reconciliation. He came to bring us to the wellspring of new life in His resurrection that He promises to all those who believe in Him. Our celebration of Christmas boldly proclaims that this is not a Christ-less world. Jesus has entered our world and our lives, and He is on the move again! I encourage you to share your faith with someone dwelling in the darkness of winter, in need of what only Christmas can bring — Jesus Christ. As you share the Christmas story you might also share this little book by C.S. Lewis. It may provide a great opportunity for meaningful discussion of the faith we share. It isn’t always winter. Christmas is still breaking into the lives of people through faith in Christ our Lord. May His gentle yet powerful presence renew your faith and warm your soul! because of its metaphor with Narnia and the Gospel of our Christmas birth! and the Christianity that lives through to us today. We need not fear the evil that surrounds us.